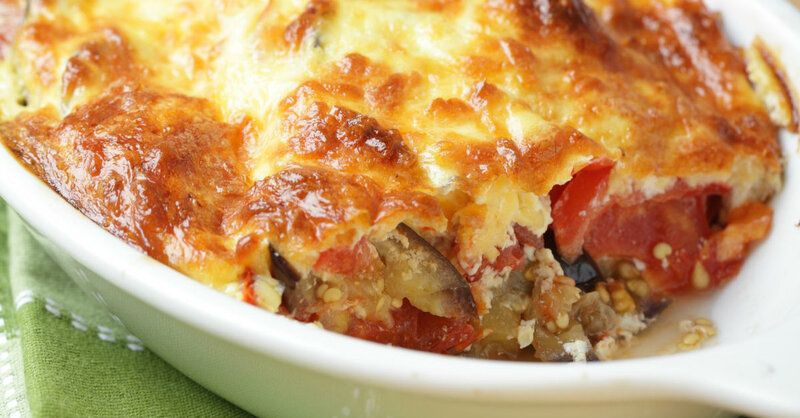 Make This Cheesy Casserole And Watch Your Family Devour Their Veggies Without Even Realizing It! We love all different types of veggies and eat them on their own regularly, but our family doesn’t approach all things green with such gusto. This means we’re always on the lookout for ways we can stuff our kiddoes with nutrients without them realizing it…which invariably leads to covering everything with cheese. And we’re okay with that. Eggplant is one of those vegetables that’s underappreciated, so we’re giving it its time to shine here and man, is it good! Along with some onion, tomato, and hearty stuffing, all covered in cheese, this is a dinner we can get excited about…try it out and see for yourself – your family will scarf it down in no time! Place eggplant and onion in a large, microwaveable dish and microwave on high for 6 minutes, stirring in the middle, or until softened and tender. Transfer veggies to a large bowl, add tomatoes, and season with garlic powder, basil, oregano, pepper flakes, salt and pepper. Mix stuffing mix into the vegetables, then transfer everything to a 9×11-inch baking dish. Sprinkle cheese evenly over the top, then cover with aluminum foil. Bake for 15 minutes, then uncover and bake for another 5-7, or until cheese is melted and bubbly.